There are currently 11,465 users on this website. Picked Up A Grab Bag Of World Coins, I Found This. I picked up a grab bag of world coins not too long ago, and it had a bunch of Philippine coins. 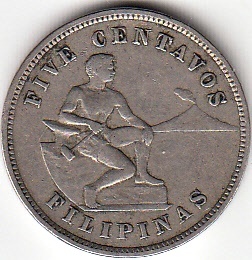 There was about 12 or so Philippine coins dated early 1900's. This coin caught my attention because it was not wore down like the rest of the coins were. How would you grade this, I'd grade it myself, but I tend to give my coins a higher grade that they are. Pictures don't do the coin justice, the vertical lines in the shield do not show any sign of wear.